* The IMETI2015 conference will be held at E-DA ROYAL HOTEL, E-DA World in Kaohsiung. There are a theme park, a shopping mall, a villa, and two hotels in E-DA World. If you would like to know more information about E-DA World, please refer to these links below and enjoy those beautiful photos! E-DA World, which is located right beside Quan-Yi Mountain, a scenic area of Kaohsiung City, includes I-Shou University, I-Shou International School, E-DA Royal Hotel, E-DA Theme Park, E-DA Outlet Mall, E-DA Skylark Hotel, and E-DA Royal Villa. E-DA World is not only one of the best vacation spots of southern Taiwan ,it is also the only complex in all of Taiwan that contains eight main categories (leisure, holiday, health-care, education, art, culture, shopping and real-estate development)This international vacation hotspot is the one and only location in Taiwan that combines five-star restaurant dining, extensive shopping, and theme park attractions. All of these features are made convenient and available to all of visitors. At E-DA World you can experience the comfort, and convenience of Taiwan while enjoying the excitement of an international atmosphere. With romantic views from the light filled Ferris Wheel, and the excitement of a Greek Aegean Sea styled theme park, E-DA world gives you the feeling of being at a foreign Shangri la. 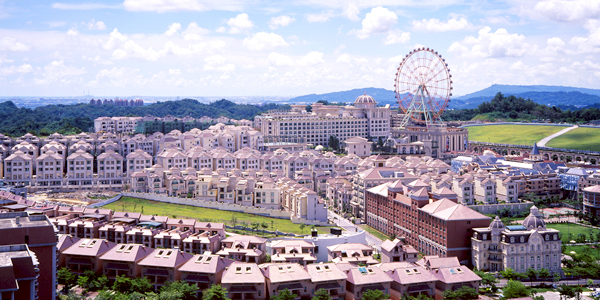 E-DA World is not only the largest tourist resort within Taiwan, it is one of the biggest projects that have been created. E-DA World has even been referred to as an “eastern Caen”, and has hosted a well-regarded Asia Pacific Film Festival and holds a New Year’s Eve Party as well as a Kaohsiung Lantern Party. If you want shopping, attractions, or simply to see more of Kaohsiung, E-DA World is sure to meet all of your needs.